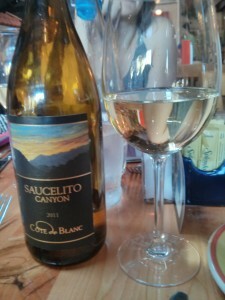 While weekend getawaying in San Luis Obispo with three lovely ladies, I imbibed the 2011 Saucelito Canyon Cotes de Blanc. This blend smells of peaches and melon and lays heavy on the tongue, lingering for awhile, in a good way. It has a pleasant hint of butteriness and its light minerality gives it a dash of crisp bubbly. The blend of Grenache Blanc, Sauvignon Blanc, Viognier, Marsanne and Roussanne is a drier white and it’s sweet, but not too sweet, a perfect match for the thai salad I ate with it for dinner at Big Sky Cafe, a wonderful foody haunt in SLO. The next day we drove by the winery as we headed to the wine trail. Sadly, we didn’t make it there in time, but I heard they have stand-out Zinfandel. For another visit! Alcohol content: Whoops, forgot to jot it down! When to drink: This would be lovely for a midmorning brunch/lunch featuring something with a little spiccccy.